North Korea has threatened to detonate a nuclear device aboveground. Such a test could turn China, and the world, against it. The US may even strike to prevent it, but North Korea may do it anyway. North Korea recently repeated its threat to test a nuclear device aboveground, in what would be its most dangerous and provocative move ever, unleashing a massive explosion and hale of radiation that could turn the world decisively against it. After President Donald Trump threatened to "totally destroy" North Korea if provoked, Pyongyang responded by saying it may test "an unprecedented scale hydrogen bomb," which experts interpreted as possibly meaning a detonation of a nuclear-armed missile above the Pacific. But regardless of what Trump says, North Korea has reasons to test aboveground. For one, North Korea's last test of a massive hydrogen bomb nearly destroyed the mountain they tested under. Earthquakes rumbled from under the mountain weeks after the test, and satellite imagery suggested a giant shift. The tunnels North Koreans use to access the site may have totally collapsed, and no reports indicate renewed efforts to dig into the site. 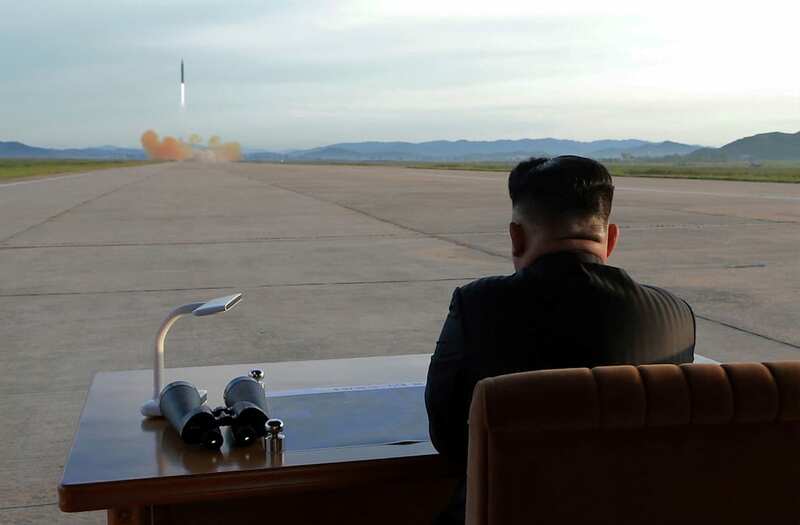 Doubts also remain about North Korea's ability to field a reentry vehicle, or the part of a missile that carries the warhead to the point of its detonation. In previous tests, the vehicle reportedly failed. North Korea has tested a thermonuclear device and tested intercontinental and intermediate-range ballistic missiles but never demonstrated its ability to combine the two. Launching a nuclear-armed missile and having it detonate above the Pacific would prove its mettle. But political and nuclear fallout from such a test could range from severe to catastrophic, according to experts. "If North Korea does do an atmospheric test, it really does change the game," Jenny Town, the assistant director of the US-Korea Institute and a managing editor at 38 North, told Business Insider. In the event that North Korea does an aboveground test within its own borders, and not on a missile, it presents a huge risk of nuclear contamination spreading into China's borders. Beijing would "see that as an attack on China," said Town. Tong Zhao, a leading expert on North Korea at the Carnegie Endowment for International Peace's Nuclear Policy Program in Beijing, told Business Insider that if North Korea does detonate a nuclear bomb over the Pacific, "the Chinese position to North Korea can be fundamentally changed." Ultimately Zhao doubts that North Korea would pull such a stunt, given it relies on outside help from countries like China. But according to Yun Sun, an expert on Korean and Chinese relations with the Stimson Center, even an aboveground nuclear test wouldn't make China fully turn its back. "If question is whether China will abandon North Korea or support regime change, I think that's far fetched," Sun told Business Insider. Time and time again, North Korea has expertly escalated tensions to a point just short of all-out war, but experts remain divided on whether firing a nuclear-armed missile over the Pacific for the first time in history would cross the threshold of kinetic action. Bonnie Glaser, director of the China Power Project at the Center for Strategic and International Studies, previously told Business Insider that such a test may elicit a kinetic US response. "If North Korea has a ballistic missile on a launchpad that we think is armed with a nuclear warhead," then the US would seek to eliminate that one single missile, Glaser said. "But even a strike on a missile on a launchpad could result in retaliation." US intelligence will continue to watch North Korea's movements closely and determine how to proceed, but North Korea's defiance of international law and determination to continue its dangerous testing brings the world closer to war. What should you do in the event of a nearby nuclear attack? Click through to learn more. Seek shelter immediately, towards the center of a building or -- preferably -- a basement. Aim for the same type of shelter you would utilize in the event of a tornado. The next three slides are examples of nuclear shelters that exist around the world. Dense materials, including dirt or thick walls, provide the best defense to fallout radiation. If possible, take a warm shower -- but do not use conditioner, as it can bond to nuclear particles. Do not seek shelter in a car, as they won't provide adequate protection, and you should not attempt to outrun nuclear fallout. The nuclear fallout zone shrinks quickly after an attack, but the less dangerous "hot zone" still grows. Once you are sheltered, do not leave. Listen to a radio or other announcements.